John Lyle Fleisher grew up in the Santa Barbara area and attended local schools. He started piano lessons at the age of 7 that started a lifelong love affair with music. He took up playing guitar at the age of fourteen, learning first from his older brother Jay, and then taking formal lessons from several teachers in the area. John attended the prestigious Musicians Institute of Technology in Hollywood California from 1983 to 1984, and received a degree in Guitar mastery. 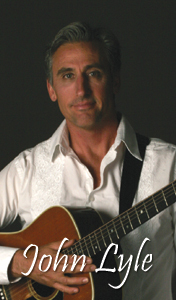 John has studied all styles from Jazz to Blues to Rock, and specializes in Acoustic guitar. John is also an accomplished vocalist, and has recorded many of his own vocal and instrumental compositions. John has been playing professionally in bands and as a soloist at many venues and private functions in the Los Angeles and Santa Barbara areas since 1984. Copyright imedia design business. All rights reserved.